To buy gold investment grade physical bullion in times of negative interest rates, increased financial risk and ever present inflation has always shown to offer the best form of wealth protection. This type of investing is a long-term strategy with the intent of protecting any wealth you have accumulated so far, be it big or small. This applies to individuals and business alike. This is approach is really the opposite to trading with gold. Preservation is not about making a profit, it's about keeping what you have. What does 'purchasing power' mean? Very basically, it is how much a unit of any currency can buy and it has all to do with inflation or deflation. Inflation is the most commonly cited example so we'll use it in the diagram below. As you can see, inflation is a destroyer of wealth by corrosion. All people rich and poor are affected. But this is easy enough to protect against if you simply buy gold investment bullion for the long-term which you will see why below. The only good thing about inflation is that it makes existing debt cheaper (which is a story I'll save for another time). Another way of presenting the effects of inflation is given by the global finance company PIMCO. Why Doesn't It Seem To Be a Problem? 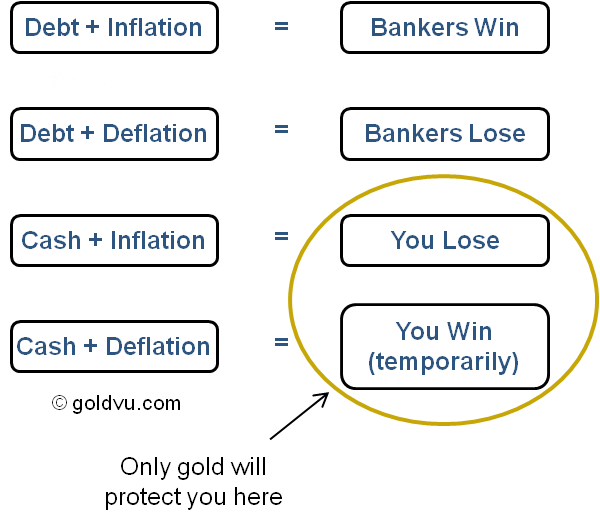 Inflation is caused by 2 factors. The primary factor is the creation of new money through the simple fact that our current money is a debt based fiat currency which is always generating new money and large events such as Quantitative Easing. The secondary factor is the movement of that money through the economy, known as 'velocity of money'. Monetary amounts around the world have expanded at a massive rate, but there has been no real increase in inflation letting people fall into a state of complacency. Furthermore, the government has been manipulating the statistics that are used as reference to identify inflation. An example is that they have deleted food price increases from inflation calculations as increases in food price are amongst the most visible to the general population. Currently the velocity of money is very slow and it's falling, which is why all the trillions of new US Dollars haven't hit the street yet with any meaning impact. However, the rate of velocity oscillates (goes up and down naturally) and it is due for a turn to the upside. Normally this isn't a problem, but these aren't normal times. Changes in direction of movement and speed have massive impact on inflation. So when the velocity starts to increase (likely to be very soon), so will inflation. When the velocity of money starts to rise, the inflation rate will rapidly increase. The Federal Reserve will have to combat this inflation by increasing interest rates, which they refer to as 'tighter monetary policy'. The government can't afford an increase in their debt payments (not that they can afford it at 0% either). Let inflation rise unchecked, leading to hyper-inflation. Eventually destroying the currency. Increase interest rates, which will have to eventually go well beyond the 18% Volker had to do (he was a past Federal Reserve Chairman). This will collapse the financial system and force the government to default. Eventually, destroying the currency. Or both, by increasing interest rates and printing more money to prevent debt default - this then causes a massive feedback loop. Eventually destroying the currency. A another impact is that the Federal Reserve will also like demand an increase of reserve requirements for the banks which they can't afford either, causing several financial institutions to implode (unless they buy gold investment bullion rather than the paper version they create). 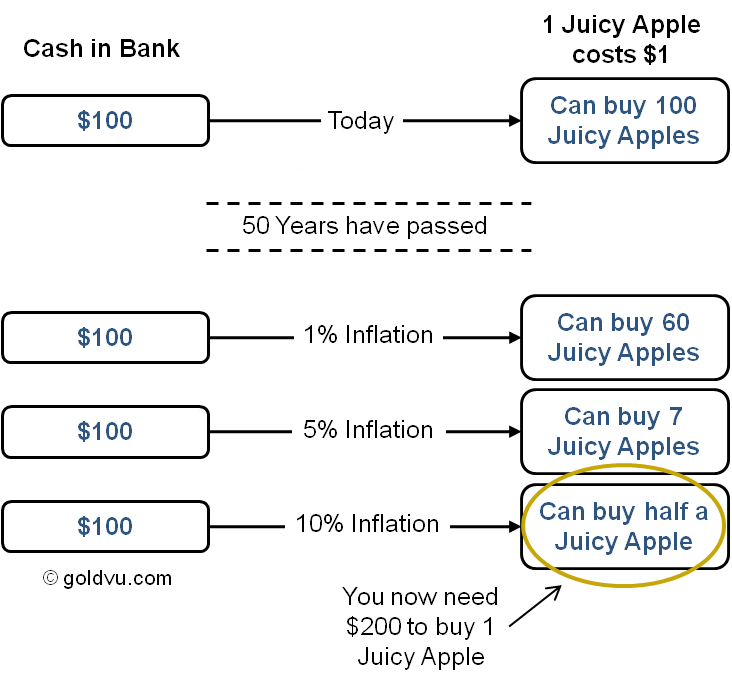 Whatever the Federal Reserve chooses, the eventual interest & inflation rates will make you wistfully dream of the cheap days when you could buy half a Juicy Apple for $100. So, bad news all-round then! But you'll be laughing about it if you had the foresight to buy some gold investment bullion. In a deflationary scenario the opposite occurs - you can buy more Juicy Apples for the same amount of cash - not so bad then! (However, you will still need to buy gold investment bullion as this isn't that good). Contrary to what the government, bankers, financial institutions and experts tell you, deflation is not really such a bad thing, especially after nearly a century of inflation as there is plenty of room for claw back available. Why Do They Tell You It Is a Bad Thing? It's because it makes existing debt more expensive and everyone has a massive amount of debt which is already too expensive for them to pay off. It's no wonder the financial institutions try to scare everyone about deflation and try to get you to vote for inflation (in fact they also try to scare you out of trying to buy gold investment bullion - almost feels like they are out to get you!). They built up their debt without concern and they now want a free pass through money printing, payouts and inflation at your expense and loss. 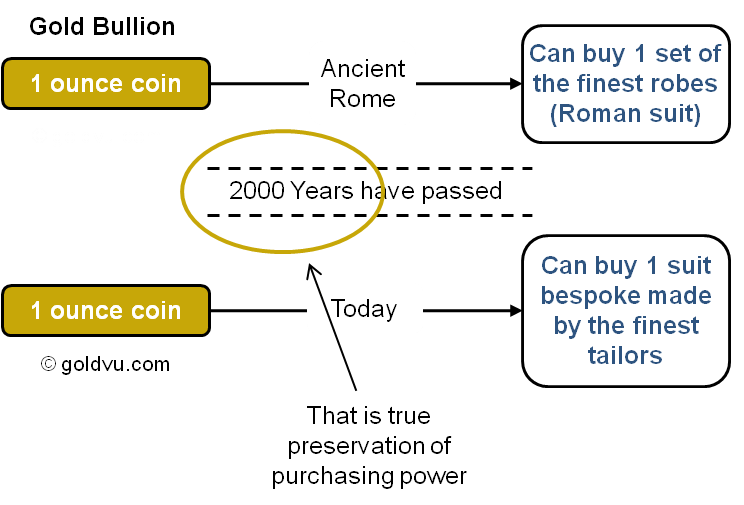 However, as in the diagram above, deflation is only so good as it will cause a huge amount of damage to economy because so many people, companies and institutions have debt and they will likely be forced to declare bankruptcy. This will cause the economy to collapse and eventually destroy the currency. It doesn't matter which scenario happens as the difference between the 2 views is a matter of semantics rather than reality. The outcome for all fiat currencies will be the same - they are eventually destroyed. Time and time again, gold and silver bullion have shown themselves to offer the best protection against what always happens to fiat currency. With the huge amount of systemic risk that exists throughout the economy it is possible for inflation to jump quickly if something cracks. Don't try to time it or play the markets by trading without building a core holding. The risk of something big going wrong with the financial system is just too great. When public confidence in the market fails, the economy will start to collapse quickly. It will be at this point that vast amounts of money will rapidly move into and buy gold investment grade bullion and there will be nothing left for you. Supplies of physical gold bullion are very limited and it will not take much money to dry up what is available. Once this happens the physical bullion will only become available to buy again once the prices are much, much higher! So buy gold investment bullion whilst you can. This is a primary reason for not trading gold, unless you have built up a core position, and why you should be holding onto it for the long-term. Simply buy the bullion whilst you can before everyone else tries to. You really don't want to queue for the exit when the financial houses are burning down around you. Store it for the long-term and you will not be disappointed in how it will protect you and your family's wealth. And if you also do this for your company, you will find it to be in a fantastically strong and safe position as the rest of the economy goes down the drain. When you start to buy physical gold or silver bullion as a way to insure your financial future and a way protect your purchasing power, you need to identify a solid and reputable international bullion provider such as GoldVu. Create either a demo account to give us a test drive or to sign-up for a full holding to buy gold investment grade bullion to preserve your wealth, visit our registration page.